More than 50 percent of homebuyers age 50 and younger find the home they actually purchase by themselves via the internet. According to a recent in-depth survey by Zillow, internet leads to real estate agents are up 300 percent over previous studies. If you're not receiving the same number of leads through the internet as you have referred to you, then some other broker is getting your leads -- because your internet presence needs work. A recent Zillow Group survey of more than 13,000 homebuyers and sellers demonstrates that this year, 28 percent of buyers age 50 and younger now find the real estate agent they purchase a home through via the internet. This is up 300 percent over the National Association of Realtors’ earlier 2016 survey stating that about 9 percent of homebuyers in this group find the agent they work with online. 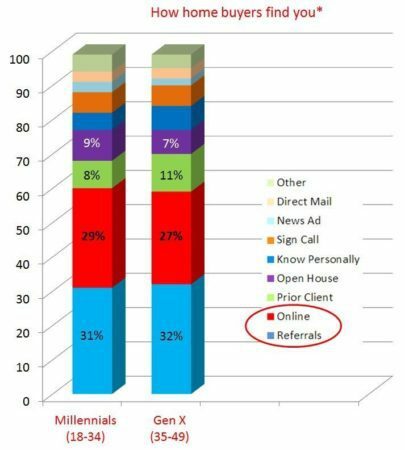 Of concern to real estate agents is that buyer leads through the internet in this group nearly equal to the number of buyer leads directly referred to agents from friends and prior clients (28 percent of leads via the internet vs. 31 percent of leads via direct referrals). Based on this market trend, today you should be capturing and signing as many clients through your website as you have directly referred to you. Consistent leads from multiple sources mean steady income and an upward growth trajectory. Reviewing the honest feedback from homebuyers, here are six trends creating this tilt, and therefore six actions you need to take to get your fair share of internet-based leads. Most homebuyers are evaluating and judging you prior to ever interviewing you, and this likely holds true even for buyers directly referred to you. Essentially, you need to prove your specific real estate and neighborhood knowledge, display your reviews and even present your prior sales before you will have a chance to talk with or interview with potential clients. There’s only one way to do this: on the internet. Is your website demonstrating this requisite information about you? If not, then someone else is likely capturing the 300-percent increase in internet leads. Four out of five actions that potential buyers take to research this kind of information about you are all done on the internet — and one major step is evaluating and judging your website. They’re doing this online before ever considering emailing or interviewing you. The days of gaining an “automatic client” through referrals are waning. There are just too many ways for potential clients to research your skill sets, knowledge, reputation and sales activity on the internet. 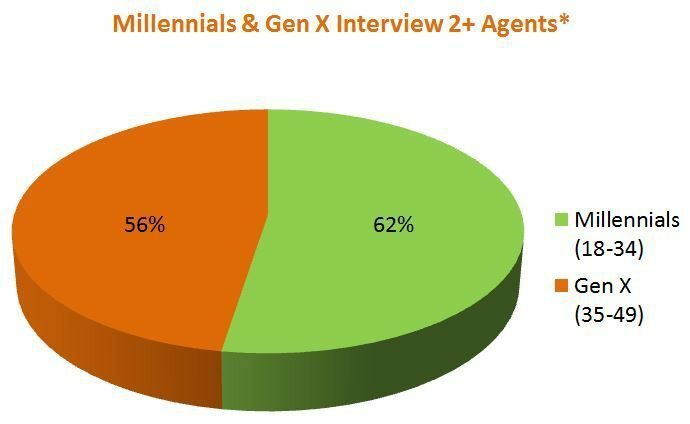 With 62 percent of millennials and 56 percent of Gen-Xers considering more than one agent, you really need to take control of how your information and skills are presented. Obviously, the internet location you have the most control over is your personal website. NAR’s own statistics show that how buyers find the home they actually purchase has long since shifted — from the majority of information coming from the MLS through agents to the buyers finding the home they purchase by themselves via the internet. The most active and largest group of homebuyers, those 50 years old and younger, are nearly twice as likely to find the home they actually purchase by themselves via the internet than having an agent find it for them through the MLS. This is a huge, irrefutable trend and one that cannot be stopped. So maybe it’s better that you use the actions the market loves to do — search for homes — to your advantage. The marketplace is absolutely addicted to real estate information, with 97 million visitors to just the top four web portals each month. You can either ride this trend by helping feed the market’s real estate information addiction or be left behind. Yet most agents’ websites do not do this. Finding a home they love is the number one desire of homebuyers, year after year, and it’s 400 percent more important to them than their second biggest desire, “help negotiating the terms of the sale,” per NAR’s profile. Yet the home search technology almost all of the two million agent websites offer is more than 20 years old and based on criteria that do not make a buyer fall in love with a home: price range, bedroom count and bathroom count. Certainly these are base requisites for each homebuyer, but they are not the reasons they fall in love with and buy a particular home. Why do you make them use such archaic home search tools? Does your website demonstrate your skills, knowledge, areas of expertise, neighborhoods, reviews, prior sales — and, most importantly, help buyers fulfill their greatest desire of finding a home they truly love? The marketplace has told you who and what they are looking for, how they are evaluating you and where they are researching you — all before ever considering calling you. Differentiating yourself from the 2 million other agents and their websites is now up to you. 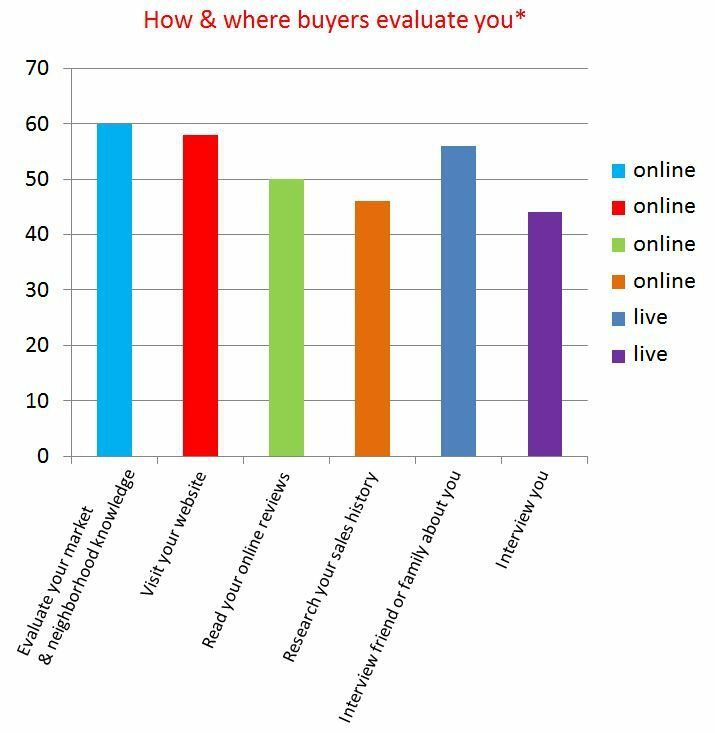 Knowing everything buyers expect from your website is just part of success. The real secret separating the pros from the amateurs is taking action and taking advantage of this knowledge. The Tech Broker Tilt has already occurred. You are either riding this wave to your advantage or are being left behind. Homebuyers today do not need you to find the home they actually purchase. In fact, they are nearly twice as likely to find the exact home they buy all by themselves using the internet as you are to find it for them via MLS data. So you need to make them want to work with you when they are ready to buy. Statistically, more than 80 percent of buyers use a real estate agent. But they will spend months doing their own research on both homes and potential agents via the internet before contacting someone. Therefore, it behooves you to have a website allowing them to find the home they love and that offers hyperlocal information they cannot get on a national based portal. Because if you don’t, they are going to use somebody else’s website and services. Creed Smith owns QValue and is the Demon of Marketing. Who has real power in the real estate industry?